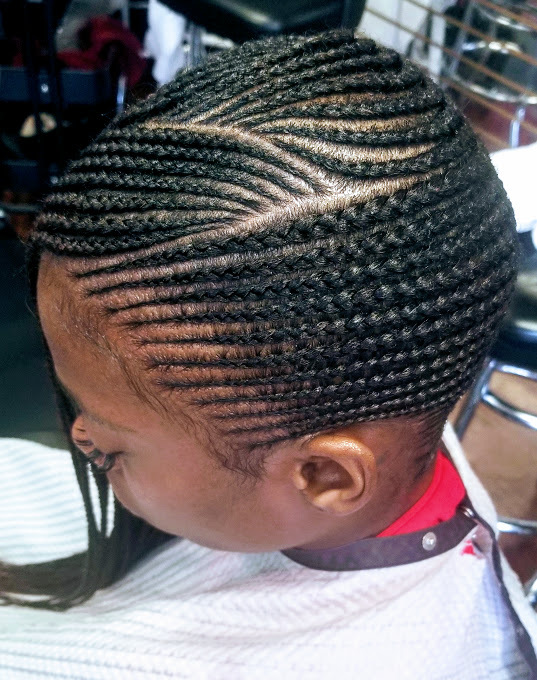 If you’re looking for Indianapolis Lemonade Braids, there’s no better place to go than Rama’s African hair braiding salon. At Rama’s we have more than a decade of experience putting in braids of all shapes, sizes, and fashions. We take great pride in offering our customers the very best hair care in Indianapolis. 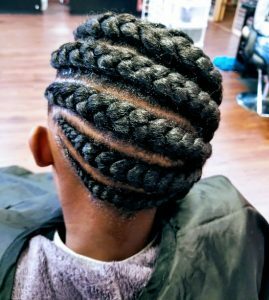 Our stylists are passionate about the work they do and are known in the local community for their amazing braiding skills. So if it’s skills and service you’re after, come to Rama’s. We’re conveniently located at 5050 East 38th Street. 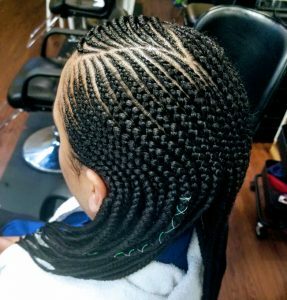 Feel free to stop in any time during normal business hours or call ahead to schedule an appointment for your Indianapolis Lemonade Braids. What Are Indianapolis Lemonade Braids? For those of you not in the know, Lemonade braids came into fashion thanks to Queen Bey. When Beyonce’s album Lemonade was released in 2016, it was accompanied by a 65-minute long film of the same name. The hairstyle that has now become known as “Lemonade Braids” is a mixture of cornrows and box braids. 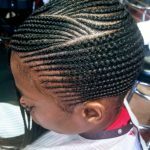 The cornrows sweep from one side of your head to the other, ending in a cascade of box braids down the other side. This creates a distinct side-swept look that’s feminine, fashionable, and fabulous. Lemonade braids existed for a long time before they ever earned that name. Prior to the release of Lemonade, you might have simply referred to them as “side braids.” This hairstyle might not have been created by Beyonce’, but its recent rise in popularity has everything to do with her status as a style icon. While it’s true that Lemonade braids are trendy, this is the type of trend that won’t be dying out any time soon. Lemonade braids have become a popular style choice for many women not just because Beyonce’ wore them, but also because they’re beautiful, easy to take care of, and a great way to protect your natural hair. If you want to match your braids to your natural hair color, there’s absolutely nothing wrong with that. But for the more adventurous at heart, you can customize your Lemonade braids by adding a splash of color. Just take a look at Nicki Minaj in the video for “MotorSport” – she’s rocking some amazing floor-length pink Lemonade braids! So maybe bright pink isn’t your color. You could always go for burgundy, purple, blonde, auburn, or even just a light brown. The choice is yours! You can also personalize your Lemonade braids by varying the size of the braid itself. The standard version of this hairstyle uses a mid-size braid, which looks amazing. But if you’re looking for something just a little bit different, you can change it up by using microbraids or large puffy braids instead. Another great way to customize your Indianapolis Lemonade Braids is by adding accessories. Some of the best accessories for braids are beads and cuffs. You can find beads and cuffs in a wide range of styles. Whatever look you’re going for – classy, retro, bohemian, tribal, gothic, punk, or princess – you can find beads and cuffs to match. But cuffs and beads are just two of the more popular braid accessories out there. You could also add your own personal touch by weaving ribbons, strings, or yarn into your braids. There are countless ways to accessorize your braids and make them reflect your own personal style. If you’re ready for a change and are sold on Lemonade braids, just give us a call at 317-496-8229 to make an appointment. We’d love to help bring out your inner diva and let her shine. We can wait to see you at Rama’s!